This has recently been my session beer to have with guys when they come over. I bought a couple of cases when it was on sale, and really enjoyed it as a session beer. Hopefully after a few weeks off it these last two will review nicely. It's quite a sad day when my session beer runs out, it's alright though as the next one in the fridge was free and is pretty decent. Tahiti is also known as French Polynesia in some countries. It's quite a small island in terms of population but their beer is pretty decent, anyway let's review it! What more can you ask for in a cheap beer, this beer looks pretty much perfect. It has a nice deep golden colour with plenty of carbonation rising to a three finger white head. The head disipates quite quickly but leaves a nice ring of foam around the glass. The lacing is minimal however there is some present, overall it's one of the best looking island lagers you are going to find. The nose is quite good as well, it's not cheap or nasty. It has a lovely full-bodied malty aroma with hints of a bready nature. There is also a lot of bitterness present, this seems to be coming from the quite strong smelling herbal hops. I'm personally not seeing where the adjunct classification is coming from as I can't smell any. I've been accused in the past of being overly favourable to cheap lagers, this is because unlike a lot of other reviewers I try to review each beer on it's merit. 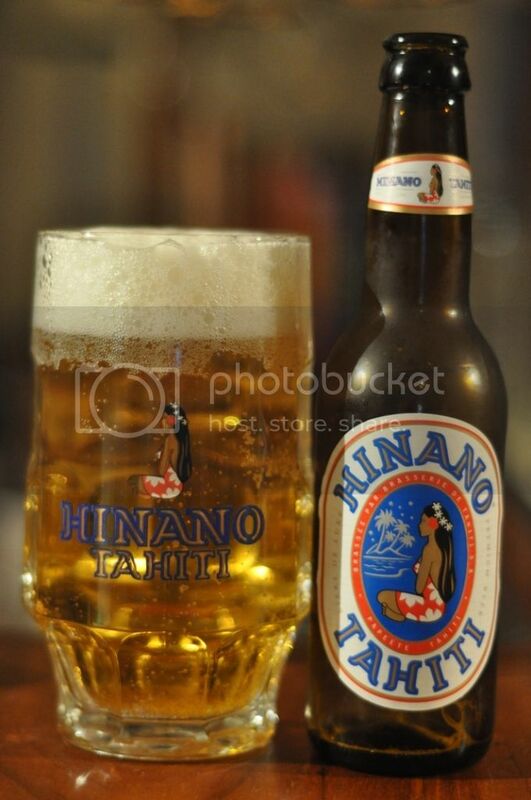 So as a cheap lager, Hinano is quite exceptional. It's drinkability surpasses any of the flavours present, which are mostly of bitter hops and grains. It's a great summer beer as if this is served ice cold, as mine was, it's excellent! Hinano doesn't try to be anything that it can't be, and by that I mean that this is a simple lager brewed to drink in large quantities. By no means is the flavour exceptional, but it's more than drinkable and most importantly you can drink it very quickly. This is an ideal session beer, it's such a shame my 3 cases are gone but if I can find it again it will certainly be back in the fridge. Get on this if you find it, it's a really nice drinking lager. This one came from Get Wines Direct in Melbourne.